Some movies improve in your estimation as time goes by. “Sicario” is one of those. While I believe my criticism of it was reasonable, as time has passed, I find myself thinking more and more positively about it. Or rather, more connected to the emotional power of the story than impeded by its film-craft. * The acting is top-notch – especially Damon. Pena and Bean are also especially on point…as always. * The photography is incredible. * It’s a good, old-fashioned, well-executed, All-American, rescue flick. * It packs enough a of an emotional punch that you will probably get some tears. * Finally, there are moments where I was astonished by the faded-grey reminder that we, as a species, can actually put aside our differences when an event compels us to…ie. Apollo 11, JFK’s assassination, the Challenger tragedy, 9/11 – some good , some terrible…all hypnotic and all, eventually, drawing us away from our stupor of vitriol – even if just for a short time. And it’s been so long since we weren’t yelling at each other…maybe since 9/11…that it literally took my breath away to witness it…even if it was in fictionalized form. Okay…my problems with the movie? * It’s at least fifteen minutes too long. * There is no point in seeing this film in 3D…it truly adds nothing to the film – which dismays me, because I’m a huge proponent of the technology if used well. * Worse, everytime Scott’s camera lens is supposed to be from the point of view of an actual video camera (which is at least a third of Mars screen time), they continue the 3D effect. When you look through a video camera you do not see things in 3D. I can’t imagine they didn’t think how odd that would be…so I see it as a mistake. Thought about it every time they went to it. So, small cons…huge pros! Right? So why did the good feeling not last for me? Well, with the exception of “Gladiator,” none of Scott’s movies have real lasting power for me. His films are so interested in scale and scope – even when they are as human as this one attempts to be – your brain is left with imagery instead of emotion. 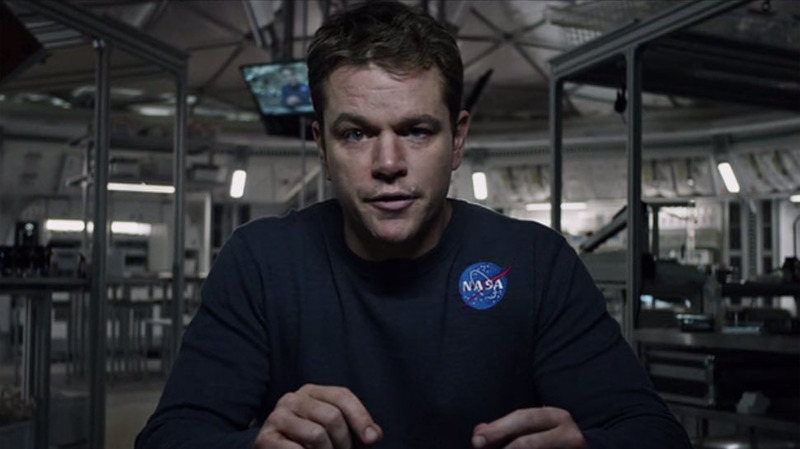 And while I’ve heard many people say that “The Martian” is the “Apollo 13” of the millennial crowd, alas, it isn’t. Not really. It probably could have (maybe even should have) been, but it falls short. It’s very, very good, mind you, and I highly recommend you see it. But I can’t call it a great film…only a great flick. And while I suppose that’s good enough, a simple trim of some of the space capsule’s weight would’ve made all the difference.